The first core mechanism is time – many actions use up time which each player tracks with a marker around the edge of their player board (their farm). Quite often, the player has a choice to spend time or use resources to do things like making a plough, but many options require time like travelling, or training a craftsman. When the time marker completes a circuit of a player’s board, one of the eldest villagers of that player passes away and is either placed into the history books or in an unmarked grave (more on that later). The second core mechanism is the action/resource system. The main board shows a village with seven main locations that offer different actions. At the start of each round, a fixed amount of resource cubes (drawn randomly from a bag) are placed on each location – the number of resource cubes is determined by the number of players. On a player’s turn, they take 1 cube from a location and may then perform the associated action. If there are no cubes at a location then you can’t do the action (unless you spend 3 matching resources which lets you do any action). So, not only do you need to think about what actions you want to perform, as well as which resource cubes you want, but you also have to grab the actions (and/or resources) you want before someone else does. It can be tense stuff. 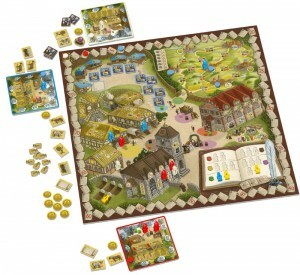 Player board showing a farm (with no villagers in it) and the time marker. Most cubes are resources but the black cubes are plague cubes which cost a player that takes them 2 time in addition to any time from the action too. These aren’t great but, whilst someone’s got to take them at some point, sometimes proactively taking them and losing time is worth it to be able to take the relevant action. In fact, burning time can sometimes be tactically advantageous (which I’ll go into later). The village’s history book has a limited amount of spaces for villagers. When a villager dies, they are placed in an available space that matches the location they came from (craft, travel, council, church, plus the player’s farm board). 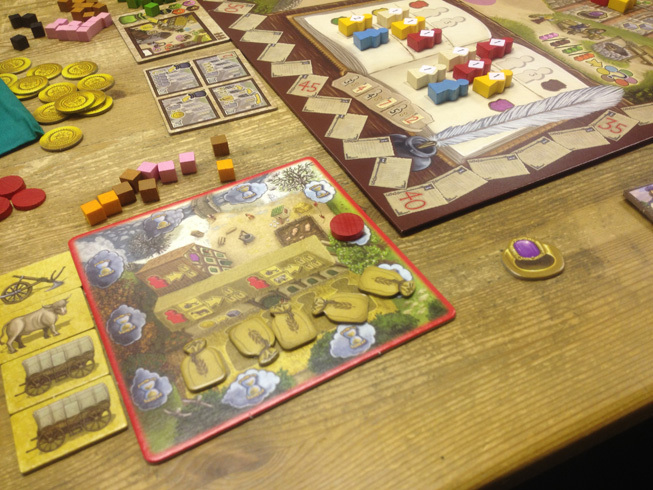 If a player has 3 or more villagers in the book at game end, they score VPs. If there is no space in the relevant category for a deceased villager, they go to an unmarked grave (so sad) which scores zero. The game ends when all the spaces in the book are full, or when all the unmarked graves are full. Points (VPs) are earned from many areas – villagers in the book, sales at the market, other villages visited, remaining coins, council members, and clergy in the church. The reason why I like this game so much is that there’s lots to think about. You need to grab the actions you want before someone else does, but you also want to grab the resource cubes you want before someone else does too – and to add to that the resource cubes you want are often not on the actions you want to perform. You want your villagers to last a long time in their positions, as there are only so many to go around, but you also want them to die off so you can get them in the history book too. You want items to sell at the market, but also need those items for other things like travel, grain production and council membership. It’s impressive how much depth there can be in a game that isn’t even a very long game either (especially if you use a lot of time too). As the game end is triggered when either the history book, or unmarked graves, are full, players can try to manipulate when the game ends. Quite often, at least one player is trying to kill off their villagers to get them in the book. Also, the game can end quicker than you expect if you;re not paying attention too – in one two-player game, I had a mass of resources ready to clean up on VPs and my opponent filled the unmarked graves – oops, my bad. As VPs can be gained in many ways, there are lots of approaches you can take. You’ll probably focus on a few areas, but you need to have a bit of a plan to maximise these. Weirdly, the book feels very important because it earns points and can end the game, but the VPs from the history book are actually well-balanced with VPs available from other areas so VPs from all areas are important. 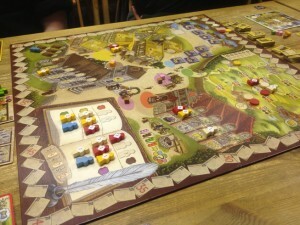 The game plays well with 2 or 4 players as you still get the same number of actions and some elements are scaled. With fewer players there may be less competition over the resources but there are fewer of them. The game looks great too with great artwork that really matches and adds to the theme. The icons used to show costs on the baord and on the player’s boards are very well thought out too. The only thing I thought odd is that you use the same number of plague cubes no matter how many players so they’re a bit more frequent with fewer players. It’s not a problem, I just expected there to be fewer plague cubes with fewer players. 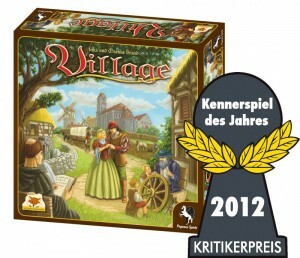 From my comments above, you will not be surprised that I think Village is a great game. The combination of different and clever elements makes it work well – each piece is relatively simple but there are lots of them. 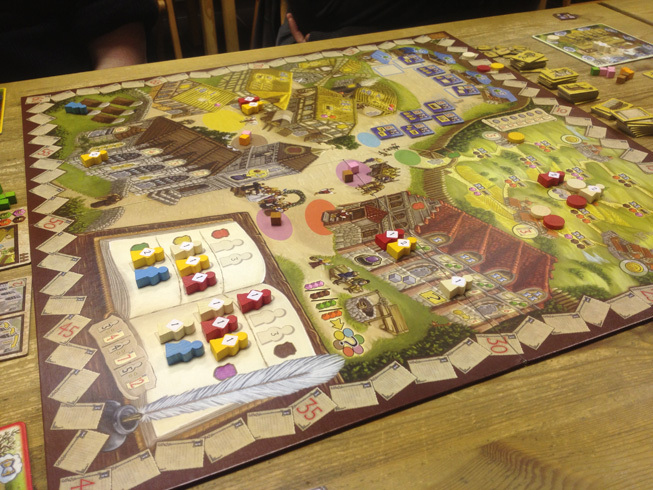 Whilst it’s a short game, it’s more of a game for players who have played a few games before and not non-gamers; which is why I think this was a deserving winner of the complex Spiel des Jahres 2012. This entry was posted on Thursday, August 30th, 2012 at 10:10 am	and is filed under Board Game Review, Board Games, Essen Spiel 11, Village. You can follow any responses to this entry through the RSS 2.0 feed. You can leave a response, or trackback from your own site.